Unless your ego is huge or you were born like Bill Gates, don’t compare yourself to Elon Musk – you’ll feel lazy. He is a high achiever on any known metric. His claim to fame initially was he made a fortune out of PayPal. But that only got him started. Today his day job is running a space transportation company called SpaceX, and on the side he is the primary financier and “strategy guy” to Tesla Motors (…you know, those electric cars). And his management strategy deserves attention. A lot of it! If you are only interested in managers of companies making buckets of profit, you can stop reading. Telsa won’t excite you – they are losing money! But their journey to growth as we speak (and one day profit) is interesting reading. Elon Musk (Tesla’s owner) may be seen in years to come as a pioneer in a ‘new’ style of Management strategy. Betting big and holding course. With all the excitement over electric vehicles, self-driving technologies, and Uber-like apps, it can be easy to forget that the car industry is more than 100 years old, and nearly impossible for a start up to break into. Elon didn’t care – he had a few billion to punt. It is fiercely competitive and is built on razor-thin margins. Missteps can be punished brutally. Tesla motors’ improbable or unparalleled success in building a viable electric car people actually were prepared to buy, was built on exploiting technology trends more aggressively than other car makers. But, it is not just about calculated risks. The initial product of Tesla Motors was a high performance electric sports car called the Tesla Roadster. Some people presume ‘Musk and Co’ had a dream to produce a high-end electric car that could compete against a Ferrari or Porsche. Not so. 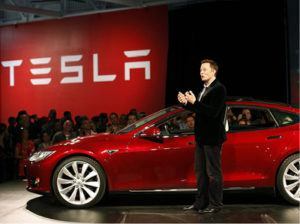 Tesla’s long term plan was always to build a wide range of models, including affordably priced family cars. The overarching purpose of Tesla Motors was to help expedite the move from a mine-and-burn hydrocarbon economy towards a solar electric economy. Critical to making that happen is an electric car without compromises, which is why the Tesla Roadster is designed to beat a gasoline sports car like a Porsche or Ferrari in a head to head showdown. The Tesla Model SP90D beat Porsche, Ferrari and Lamborghini from 0 to 100 km from a standing start! Some question whether we really need another high performance sports car. Will it actually make a difference to global carbon emissions? The obvious answer is no, it does not. Beyond pure speed, it has twice the energy efficiency of a Prius. The strategy of Tesla was to enter at the high end of the market, where customers are prepared to pay a premium, and then drive down market as fast as possible to higher unit volume and lower prices with each successive model. And they did exactly that. Tesla is a perfect business lesson in playing the long game. Elon Musk was patient. Very patient. Built the high performance car first – tick. In a world where we are often blinkered by delivering short term results, Elon Musk delivered an alternative to petrol powered cars via a long term game plan he simply stuck to. Yes that simple. Learn about Tesla and other cutting-edge business case studies in our Online Management Courses.